You ensure with the dog fit by PreThis® vitamin B complex for an ideal nerve performance for your dog and act promptly to the effects of the aging process, as the Spondylose! 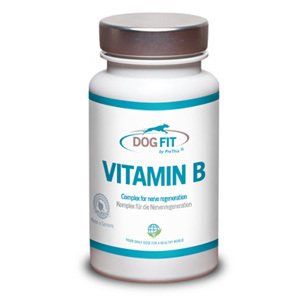 The nerve of a dog are on a sufficient supply with the important B-vitamins instructed, because these vitamins are responsible for ensuring that the nerve cells with constant energy be enriched. This will enable the vitamins of the B group the metabolism and support the dog body in this way, the recorded in food transforms in usable energy for the nerve. This energy is for the preservation and development of the nervous system of a dog which is absolutely essential! By reducing nervous performance can be in your dog the various symptoms such as a sudden incontinence of the animal, visual problems or even intolerance against stress. These symptoms can according to recent findings be counteracted by using highly concentrated and especially for dogs dosed vitamins of B group very well and in a natural way! A decreased performance of the nervous system can be caused by the different circumstances. For example, the nerve cells during the course of the aging process of a dog are always more. 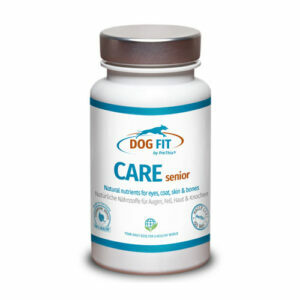 Also a wrong nutrition of the dog does often to an under supply of the dogs body with the various vitamins. Such a nutrient deficit is from the dog owners usually only noticed when a symptom, like for example the Spondylose, nervous for the decreased performance at his animal shows. The supplement DOG FIT by PreThis® VITAMIN B can be very well in an acute case of reduced nervous performance as well as a preventive measure should be administered. Prevent a timely undersupply of the dog’s body with the high-quality DOG FIT by PreThis® VITAMIN B and order today the certified Vitamin B Complex for dogs in the original DOG FIT Onlineshop! Category: Products. Tags: hunde vitamine, prethis vitamin-b, vitamin-b nerven, vitamine.